Love cheesy cheddar but looking for something better? 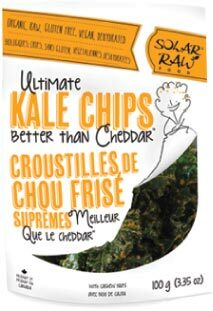 Try our ultimate kale chips better than cheddar for that cheesy taste you know and love. Our version of this favourite is made with garden fresh kale smothered with sweet red bell peppers and creamy cashews – one taste and you’ll know why its better! Do you reminisce about that sour cream and onion kiss? 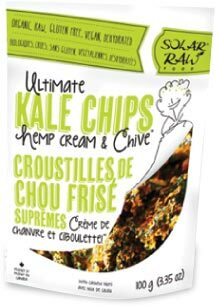 Try our ultimate kale chips Hemp Cream and Chives for that savoury onion taste you know and love. Our version of this favourite is made with garden fresh kale smothered in creamy hemp hearts and chives – one taste and you won’t be remiss! INGREDIENTS: Fresh kale*, pre-soaked cashew nuts*, pre-soaked sunflower seeds*, fresh lemon juice, hemp seeds*, coconut sap* (Coco-Natura™ – low GI), Engevita® nutritional yeast, fresh chives*, Filsingers™ apple cider vinegar*, Lumière de Sel® Himalayan Salt. 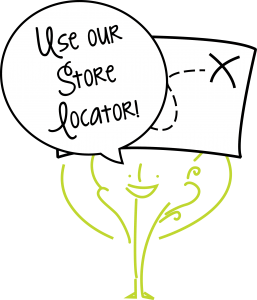 *organic. Contains nuts. Can you guess my new favorite snack?